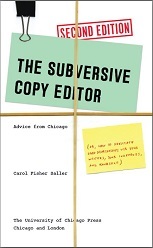 Lucy: For some days now, my Lingua Franca colleague Carol Saller and I have been exchanging queries on the productive but sometimes perplexing relationship between writers and their copy editors. Below are some of the fruits of our exchange. Carol’s post, on Friday, will feature the second half of this dialogue. I hasten to add, before we launch into the Q&A, that I have often been blessed with the kindest, smartest, most discerning, and least condescending copy editors in the universe. They have saved me from myself more often than not, and I owe them my enduring gratitude. I have not been lucky enough to be edited by Carol—yet—but her answers here suggest that her authors struck gold. We hope that this exchange is fruitful not just for us but for you, our readers. Hyphens and two-word nouns seem to be going the way of the dodo bird. In a 20-page stretch, my copy editor rendered back yard into backyard, bird cage into birdcage, picnic ware into picnicware, mud room into mudroom, family-planning notions into family planning notions, high-school chum into high school chum, re-jigger into rejigger, semi-circle into semicircle. Mostly I don’t care, but if I’ve been consistent, why should my usage be overruled? Carol: I have two answers. First, it’s a rare writer who is consistent in styling these words throughout a long article or book, and copy editors don’t want to have to record each one on a style sheet just in case we meet the same compound a hundred pages later. Instead, we edit according to house style on the assumption that the end result will be more consistent than the original was. Second, in following a style manual, your editor probably doesn’t care about those compounds any more than you do. Your use of the word overruled betrays the slightest hint of “Why does she get to be right?” It might help to know that your copy editor doesn’t think you’re wrong and might even personally prefer the forms you used. Lucy: What sort of sensitivity can I expect a copy editor to have to nonstandard syntax, particularly when it’s meant to convey character? For instance, I describe a hotel clerk’s appearance so as to suggest he’s South Asian, and I observe that he speaks with an accent. Then I have him say, in response to a wayward kid who asks for a receipt, “You are entrepreneur now?” The copy editor changes the line to “You’re an entrepreneur now?” Not difficult to change back, but why doesn’t she query before changing? Carol: Your copy editor’s change certainly was insensitive (to borrow your euphemism), but as long as the editing was visible—that is, you could see both the original and the new version—it was the equivalent of a query. Most copy editors note in a cover letter that all editing is negotiable, and that if you don’t like a change, you should stet it or rewrite it. Lucy: Is there a profound hatred of comma splices among copy editors? I sometimes like to push parataxis, e.g., “He couldn’t walk any farther, he was wiped out.” I find copy editors tend to replace the comma with a colon, a piece of punctuation that to me, in the personal essay or in fiction, is practically anathema. Carol: Hatred? No. Maybe. Yes. I’ve been struggling with this myself, having read about increasing acceptance of splices. In fiction, of course, they are old news, and a copy editor should respect them and edit only when they cause problems. In scholarly writing, however, they are still considered substandard. I love semicolons. I just counted: There are 98 in The Subversive Copy Editor. But it’s interesting that in my young adult novel Eddie’s War there are only 16, and comma splices are rampant. Lucy: I love semicolons too, a secret love to which the young writer Ben Dolnick recently confessed in The New York Times. Just for fun, I’ll put one here; if it disappears, you’ll know where the editing wind is blowing. Originally published as “Help Me Understand My Copy Editor: A Lingua Franca Dialogue, Part I,” at Lingua Franca blog, Chronicle of Higher Education, July 11, 2012.